Israeli gymnast Artem Dolgopyat won the gold medal of the FIG Artistic Gymnastics Individual Apparatus World Cup in Baku, Trend reports. He scored 15.066 points in the finals. Switzerland’s Pablo Bragger came second with a score of 14,566 points, with Spain’s Rayderley Zapata coming third with a score of 14,500 points. 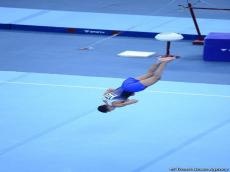 Azerbaijani gymnast Murad Agarzayev came sixth with a score of 13,800 points. Qualifications were held during the first two days of the four-day competition, while the finals are to be held during the last two days.